alaTest on kerännyt ja analysoinut 1865 arvostelut lehdistä ja verkkosivustoilta. The Xperia Tablet Z's design is impressive but it also has an excellent screen and good battery life, and its water resistant capabilities are a big point of difference against competing devices. We just wish it was a little cheaper. Does Sony make the best 10-inch Android tablet around? The Xperia Tablet Z serves as an excellent second screen. Remote functionality is easy to set up, while the display is one of the best we've seen from Sony's Xperia range, if not the market in total. 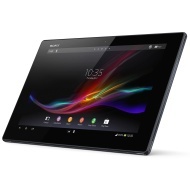 After blowing hot and cold with unorthodox designs, Sony seem to have finally nailed their tablet styling. The Xperia Tablet Z combines stay-at-home comfort with on-the-go usability. The Sony Xperia Z is a powerful, sleek new smartphone for splash-prone T-Mobile customers. Beautiful, water-resistant design. Sharp display. Good size for a big-screen phone. Mediocre call quality. Dated processor. Average battery life. The Sony Xperia Z boasts a thin, attractive design that’s also dust- and water-resistant. It’s equipped with a big, bright screen and 4G LTE, takes great pictures, and has sharp call quality. The Sony Xperia Z’s battery life is short, its camera is slow, and its processor is not as peppy as those found in other flagship phones. Its glossy chassis attracts fingerprints easily. The Sony Xperia Z makes sense if a water-resistant design and excellent photos are a priority, but skip it if you demand blazingly fast performance and long battery life. How good can the best Android tablet be? The Sony Xperia Tablet Z is among the finest Android tablets available, combining an incredibly thin and light design with top-notch performance. Remarkably thin and light. Sharp and bright full-HD display. Fully waterproof. Blazing-fast performance. Built-in IR emitter for home theater remote control. MicroSD card slot and HDMI out through MHL. Feels delicate. Slow, somewhat finicky charging. Mediocre battery life.